SCVHistory.com LW3408 | Melody Ranch Opens Its Doors for James Garner and 'Gunsmog,' 1959. Pat Dillon got the best of Rocky Nasty in Newport News. A torch singer belted out "Smoke Gets In Your Eyes" in Corpus Christi. Paladin came out of nowhere in British Columbia. 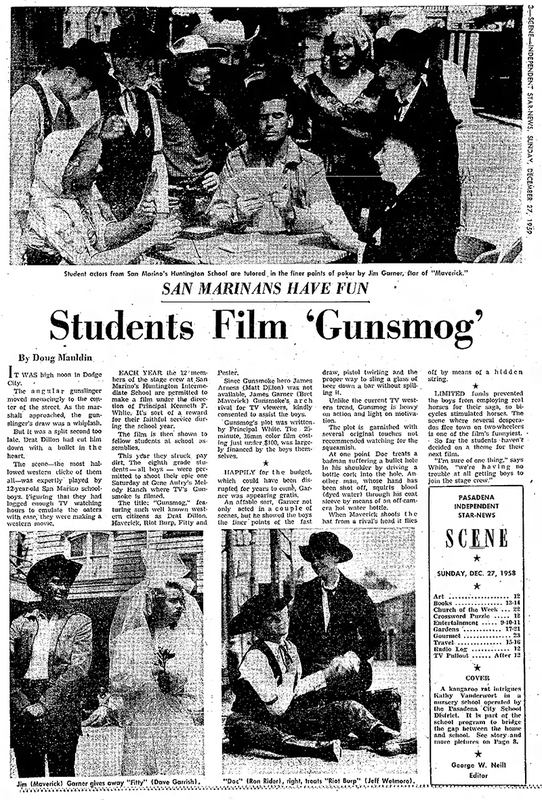 Across North America in the late 1950s, schoolchildren staged differing versions of "Gunsmog," a spoof on the popular CBS television series "Gunsmoke." For a lucky group of eighth-grade boys at Henry E. Huntington middle school in San Marino, the experience was like no other. 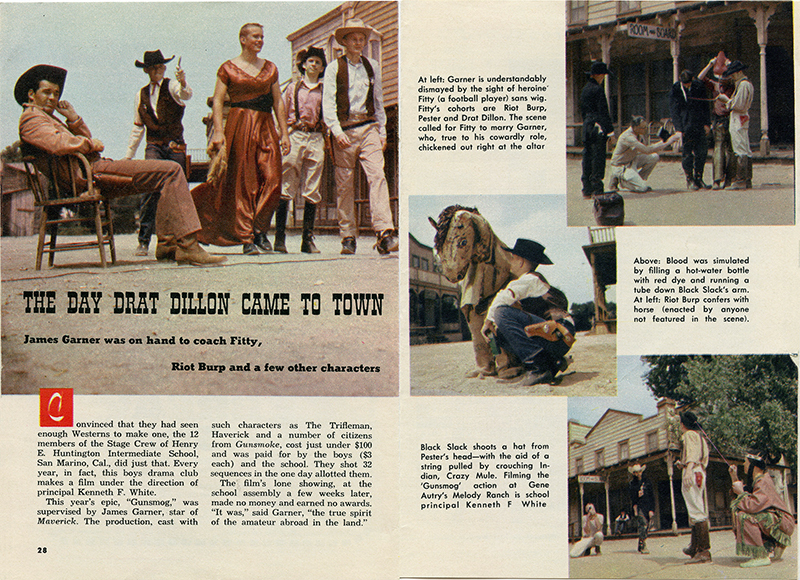 They got to play out their little drama on the same dusty streets where James Arness (as Marshal Matt Dillon) and Amanda Blake (Miss Kitty) kept audiences wondering all those years — at Gene Autry's Melody Ranch studio in Placerita Canyon. Arness was unavailable that day in 1959, so another TV Western hero stepped in to show the boys the ropes: James Garner, star of rival ABC's "Maverick." Garner (as Drat Dillon) reportedly got cold feet when the boy playing Fitty (Kitty) took off his wig. And though Black Slack managed to shoot the hat off of Pester's head (with help from the boy holding the string tied to it), Riot Burp got him in the end. James Garner was on hand to coach Fitty, Riot Burp and a few other characters. TV Guide | November 14, 1959 (Above). Convinced that they had seen enough Westerns to make one, the 12 members of the Stage Crew of Henry E. Huntington Intermediate School, San Marino, Cal., did just that. Every year, in fact, this boys drama club makes a film under the direction of principal Kenneth F. White. This year's epic, "Gunsmog," was supervised by James Garner, star of Maverick. The production, cast with such characters as The Trifleman, Haverick and a number of citizens from Gunsmoke, cost just under $100 and was paid for by the boys ($3 each) and the school. They shot 32 sequences in the one day allotted them. The film's lone showing, at the school assembly a few weeks later, made no money and earned no awards. "It was," said Garner, "the true spirit of the amateur abroad in the land." Pasadena Independent Star-News | Sunday, December 27, 1959. It was high noon in Dodge City. The angular gunslinger moved menacingly to the center of the street. As the marshal approached, the gunslinger's draw was a whiplash. But it was a split second too late. Drat Dillon had cut him down with a bullet in the heart. The scene — the most hallowed western cliche of them all — was expertly played by 12-year-old San Marino schoolboys. Figuring that they had logged enough TV watching hours to emulate the oaters with ease, they were making a western movie. Each year the 12 members of the stage crew at San Marino's Huntington Intermediate School are permitted to make a film under the direction of Principal Kenneth F. White. It's sort of a reward for their faithful service during the school year. The film is then shown to fellow students at school assemblies. This year they struck pay dirt. The eighth grade students — all boys — were permitted to shoot their epic one Saturday at Gene Autry's Melody Ranch where TV's Gunsmoke is filmed. The title: "Gunsmog," featuring such well-known western citizens as Drat Dillon, Haverick, Riot Burp, Fitty and Pester. Since Gunsmoke hero James Arness (Matt Dillon) was not available, James Garner (Bret Maverick), Gunsmoke's arch rival for TV viewers, kindly consented to assist the boys. Gunsmog's plot was written by Principal White. The 23-minute, 16mm color film costing just under $100 was largely financed by the boys themselves. Happily for the budget, which could have been disrupted for years to come, Garner was appearing gratis. An affable sort, Garner not only acted in a couple of scenes, but he showed the boys the finer points of the fast. draw, pistol twirling and the proper way to sling a glass of beer down a bar without spilling it. Unlike the current TV western trend, Gunsmog is heavy on action and light on motivation. The plot is garnished with several original touches not recommended watching for the squeamish. At one point Doc treats a badman suffering a bullet hole in his shoulder by driving a bottle cork into the hole. An oilier man, whose hand has been shot off, squirts blood (dyed water) through his coat sleeve by means or an off-camera hot water bottle. When Maverick shoots the hat from a rival's head it flies off by means of a hidden string. Limited funds prevented the boys from employing real horses for their saga, so bicycles stimulated horses. The scene where several desperados flee town on two-wheelers is one of the film's funniest. So far, the students haven't decided on a theme for their next film. "I'm sure of one thing," says White, "we're having no trouble at all getting boys to join the stage crew." LW3408: 9600 dpi jpeg from original magazine article (TV Guide) purchased 2018 by Leon Worden.